HDR (High Dynamic Range) is a feature that lets you take pictures of scenes with very dark and/or very light areas. Swipe up on the controller to enable HDR mode. The app takes two photos at different exposures and combines them to make one HDR photo. The top graph is an underexposed image, high levels of light map to dark pixels. The second graph is overexposed, low levels of light map to light pixels. 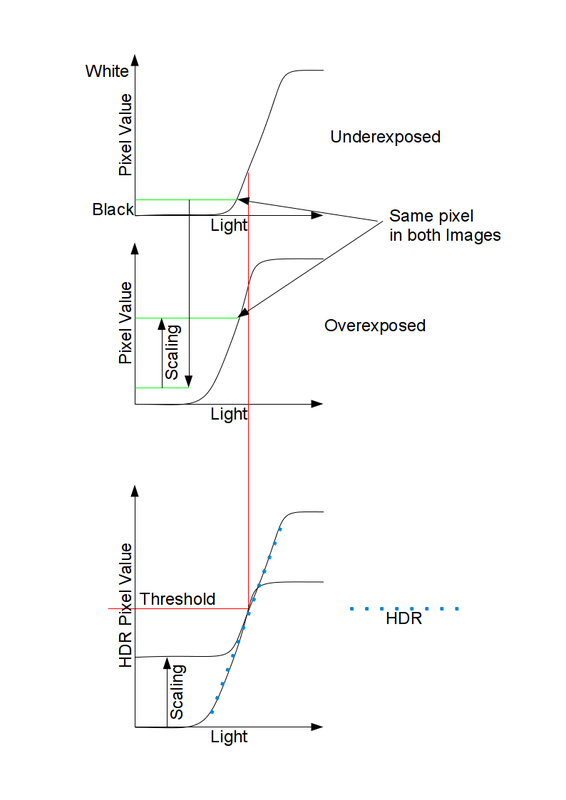 The third graph shows how the images are combined for HDR. The HDR image will use the pixels in the overexposed image up to the threshold and the pixels in the underexposed image above that (scaled to the correct values). This should explain the scale and threshold parameters, scale is usually calculated automatically but the threshold can be changed to adjust the balance between the two images. Hold the phone as still as you can between the two shots so that the image registration algorithm can match them correctly. The settings menu allows you to adjust the HDR parameters for contrast and exposure. HDR works best if the first shot is underexposed so try tapping on a bright area before taking the picture. Some devices try to change focus and/or white-balance between shots, if this happens try using a different focus mode or white-balance setting. HDR will also work in fast picture mode. HDR is supported on Android 2.3 but may not be able to capture photos at the full resolution due to memory limitations. HDR mode is still experimental, let us know if it doesn’t work well on your device. The HDR algorithm performs tonemapping using local histogram specification. This parameter defines the contrast of the specified histogram, a higher value will give a more artifical looking photo. The HDR algorithm takes 2 photos at different exposures and combines them, this setting changes the exposure compensation for the overexposed shot. This setting changes the exposure compensation for the underexposed shot. This setting changes how the HDR algorithm scales the colour information when tonemapping. Opens the HDR editor after each shot so parameters can be changed. If this is not selected, the shots used to create the HDR photo will be deleted. Some devices and certain focus modes may reset the focus after a photo has been taken use this setting to force a refocus between each shot. On most devices it is necessary to wait a short time between shots for the exposure algorithm to settle on the correct settings. The default (600ms) works well on most devices but smaller values are better. On devices with a full implementation of the Camera2 API (e.g. Nexus 5) this can be set to 0.